Fully Loaded - CARFAX Certified 1 Owner - No Accidents - Fully Serviced - Quality Certified W/up to 10 Years, 100,000 miles Warranty This Subaru includes: CRYSTAL WHITE PEARL LIMITED MODEL STI PERFORMANCE EXHAUST SYSTEM (STI) BLACK ALCANTARA, LEATHER-TRIMMED UPHOLSTERY Leather Seats *Note - For third party subscriptions or services, please contact the dealer for more information. * This Subaru WRX has been loved by its original owner as CARFAX shows it to be a one-owner. Indulge yourself with one of the most highly crafted, most luxurious automobiles available today. This AWD-equipped vehicle will handle beautifully on any terrain and in any weather condition your may find yourself in. The benefits of driving an all wheel drive vehicle, such as this Subaru WRX STI Limited, include superior acceleration, improved steering, and increased traction and stability. Added comfort with contemporary style is the leather interior to heighten the quality and craftsmanship for the Subaru WRX If, upon choosing the road less traveled you find yourself lost, relax and remember this beautiful car has navigation. 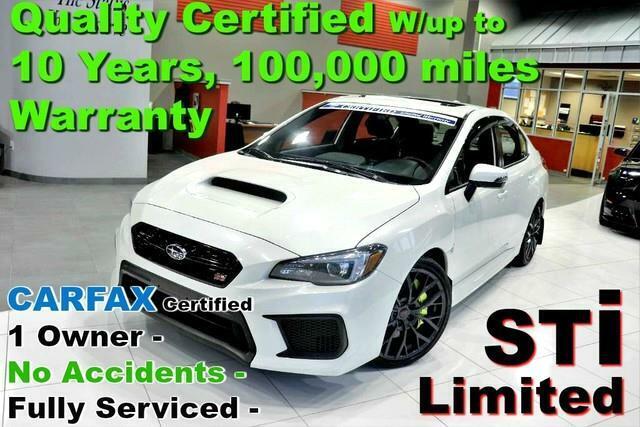 With all records included, feel comfortable knowing that the history of this Subaru WRX STI Limited is provided in order for you to make a knowledgeable decision. Rare is the vehicle that has been driven so gently and maintained so meticulously as this pre-owned beauty. Feel pleased in your decision to buy this Subaru WRX as it's still covered under the manufacturer's warranty. Some vehicles are more of a need-to-have. This one is a absolutely-must-have. If it's looks aren't enough to persuade you, the feel of the powerhouse under the hood most definitely will. This wonderfully appointed vehicle comes equipped with the options and features every driver craves. How's the paint you might ask? It's flawless. One of the best finishes we've ever seen. This is your chance to own the very rare Subaru WRX. The upgraded wheels on this Subaru WRX offer an improved ride and an attractive accent to the vehicle. No Credit / Bad Credit / No Paystubs, No problem !! ! All Approved ! Everyone drives ! CLEAN, GORGEOUS, LOW MILES, SHOWROOM CONDITION. CALL NOW QUALITY CERTIFIED up to 10 YEARS 100,000 MILE WARRANTY , To Certify a vehicle, there will be an additional cost for Certification. CALL NOW For details. STUNNING AGGRESSIVE LOOK ON THIS BEAUTIFUL--Call today to schedule a test drive... Good Credit/Bad Credit/No problem!!!! Get paid cash? No problem!! 100% Credit Approval with interest rates starting at 2.49% for qualified customers, our rates will not be beaten. We price our cars at wholesale price to guarantee the best deals for our customers. Our inventory moves quick, please call to confirm the availability of the vehicle of your interest Springfield location 973-564-0112. This vehicle is located at our SPRINGFIELD location. Come visit our new showroom in Springfield NJ. Quality Auto Center is pleased to be currently offering this 2018 Subaru WRX STI Limited with 23,960mi. You appreciate the finer things in life, the vehicle you drive should not be the exception. Style, performance, sophistication is in a class of its own with this stunning Subaru WRX. No matter the varying terrain or weather conditions, this all-wheel drive vehicle will help you reach your destination safely and securely in a well-appointed cabin with many features found on cars twice the price. This White Subaru is clean and shiny exterior makes it look like it came straight from the factory. You could keep looking, but why? You've found the perfect vehicle right here. No Credit / Bad Credit / No Paystubs, No problem !! ! All Approved ! Everyone drives ! CLEAN, GORGEOUS, LOW MILES, SHOWROOM CONDITION. CALL NOW QUALITY CERTIFIED up to 10 YEARS 100,000 MILE WARRANTY , To Certify a vehicle, there will be an additional cost for Certification. CALL NOW For details. STUNNING AGGRESSIVE LOOK ON THIS BEAUTIFUL--Call today to schedule a test drive... Good Credit/Bad Credit/No problem!!!! Get paid cash? No problem!! 100% Credit Approval with interest rates starting at 2.49% for qualified customers, our rates will not be beaten. We price our cars at wholesale price to guarantee the best deals for our customers. Our inventory moves quick, please call to confirm the availability of the vehicle of your interest Springfield location 973-564-0112. This vehicle is located at our SPRINGFIELD location. Come visit our new showroom in Springfield NJ.